The format of the book makes it a quick read, or one easily segmented into small bites. Each story is just a few pages - in some cases, just one page - with an accompanying illustration. Books about running are refreshing. They offer a perspective on the sport and all the struggles and emotions that go with it completely distinct from your own personal experiences, but can inspire on a variety of levels. Occasionally, as editor of the ORRC club magazine, I receive advance copies of books about running. These books are usually either about training and nutrition, sports psychology, biographies, or novel-format books. A book I recently received, A Race Through the Greatest Running Stories by Damian Hall, doesn’t fit neatly into any of those categories. 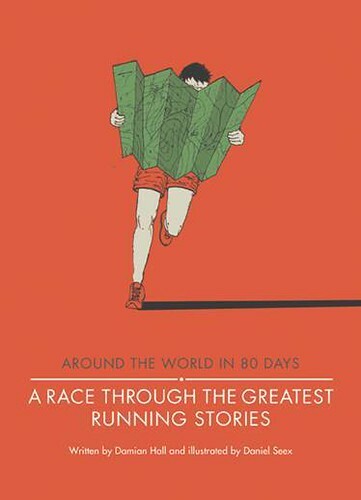 The book’s cover, which states “Around the World in 80 Days,” hints at the book’s format: 80 short stories covering everything from Pedestrianism to recent distance running greats. The book is scheduled to be released on July 6, but you can pre-order it now. This is the kind of book that would make a wonderful gift for a runner. It’s also the kind of book you’ll want to carefully read before wrapping it up, taking care to avoid creasing the spine or any of the pages. And when you read it, be sure to have a pen and paper nearby to jot down the events and personalities you want to learn more about. The format of the book makes it a quick read, or one easily segmented into small bites. Each story is just a few pages – in some cases, just one page – with an accompanying illustration. The variety of the stories introduces you to unique running traditions and shares interesting details about events and runners that most runners are already familiar with. The author is based in the UK, which may be why there’s a decidedly international feel in the way the stories were curated for the book. I actually learned a lot about how little I know about the history of the sport, and was inspired to request a few books from this title’s bibliography (Pedestrianism: When Watching People Walk was America’s Favorite Spectator Sport is one I’m especially intrigued by) from the Washington County Library. When you consider how long running has been a sport – or at least an important part of life – it’s remarkable to think of how much people accomplished with their low-tech (or no-tech) gear over the last few thousand years. The visuals in the book are as engaging as the stories. Daniel Seex‘s woodcut-style illustrations are vibrantly colored and remind me of album covers or the kind of prints you find at independent bookstores. He has teamed up with Hall before, on their book A Year on the Run: 365 Stories from the World of Running, and published two cycling books with Giles Belbin. A Race Through the Greatest Running Stories is available here for pre-sale on Amazon now for $14.33 for the hard-cover and $13.61 as a digital e-reader download.